The Girl Scouts Beyond Bars Sleepover was amazing! It was a time for pizza, salad, hugs and kisses. 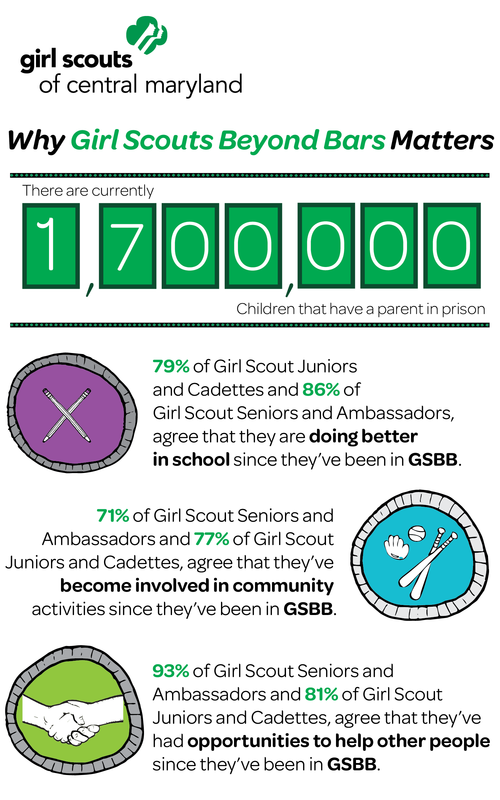 It was a rare chance for incarcerated mothers to come together with their daughters for a night of memorable fun – a night that Girl Scouts Beyond Bars troop members only get to experience one night each year. The women and girls participated in activities their volunteer troop leaders had planned, from tie-dying shirts to nail painting. I watched as a mother hand painted designs on her daughter’s fingernails and toenails. Her daughter beamed with joy as those around her complimented her mother’s job well done. Movie time was definitely an opportunity for mothers and daughters to get close and watch “Frozen” and “Happy Feet.” As one of the movies ended, I witnessed “Little J” cover her sleeping mom, “Big J” with a blanket and nestle even closer. Another mother and daughter spent their night “catching up” and reveling in their mother-daughter time. It is moments like these that the resident photographer didn’t catch, but made the night perfect; these moments explain why this annual sleepover is an important part of the Beyond Bars troop year. As a Girl Scouts of Central Maryland staff member, getting a chance to look in and catch a glimpse of the relationships and interactions between the mothers and daughters can be described in one word: PRICELESS.